Autumn Damask roses form a small, but very old group which probably originated from a cross between Rosa gallica and the autumn flowering musk rose, Rosa moschata. 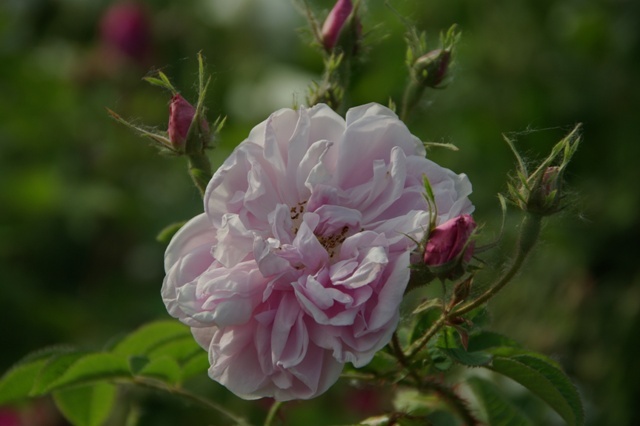 From Graham Stuart Thomas: “The Damask Roses have proved the most elusive and most diverse of all these old types. There were fewer Damasks to be found in old gardens and their nomenclature has been, and still is, the most puzzling. This is partly because they comprise so many different types, which is not remarkable when we consider their probable parentage, so fascinatingly indicated by Dr Hurst in chapter 13. It always strikes me as strange that some hybrids inclining more towards rosa moschata have not been found. In view of this mixed parentage it is very difficult to fix on a particular rose as a type of the group; some of them are open and prickly like the Centifolias, while others incline to the Gallicas. Rosa phoenicia, one of the parents of the Summer Damasks, is not an imposing plant, but sprawling, with prickly wood and small single white flowers. Its characters are scarcely noticeable in its hybrids at first sight. The more compact Damasks show obvious Gallica affinity, but all the distinct Damasks do have a soft pubescence on the upper surface of their leaves; this is specially evident in ‘Leda’, ‘Omar Khayyám’, ‘Petite Lisette’, ‘Quatre Saisons’ and ‘Versicolor’. It is safe, therefore, to think of the Damasks as having downy grey foliage, with rather prickly wood and, in many instances, rather weak flowers stalks. This is a character of the York and Lancaster Rose. The Autumn Damasks were to me unknown untill suddenly the rather poor ‘Perpetual White Moss’ sported to a pink, mossless rose. This gave me the clue and I realized I had had Rosa damascena semperflorens (bifera), the ‘Quatre Saisons’ Rose, for some years without knowing what is was. Notes on the origin and evolution of our gardens by C.C. Hurst: “To the gardener the Old Damask Roses are a very natural and charming group with their damask colouring , damasked pattern of the flowers and, above all, the damaks fragrance of their perfume; he also likes to believe the old tradition of 1551 that they came originally from Damascus with the returning Crusaders. The botanist is not so happy about the Old Damask Roses, although he has always been willing to admit that they are a natural group and has usually given them a rank of species; he realizes, however, that their characters are very near to those of R. Rubra and that these are sufficient to prove the origin of the Damask from the Red Rose (Rosa gallica). At the same time he is aware that there are certain characters of the Damask Roses which are quite foreign to the Red Rose. Analyses show that some of the Damask characters foreign to R. Rubra are those of R. phoenicia Boiss., while others are those of R. moschata Miller. It is evident therefore that the Damask Roses are all hybrids of rubra, but that some are hybrids of phoenicia, while others are hybrids of moschata. (1) x R. damascena (rubra x phoenicia). The Summer Damask Rose. Thanks for the share. Backgrounds are always my biegsgt nightmare poor taste and ability on my part I admit, but sites like these always come to my rescue. Thanks again!